Considering that the controversy surrounding this amendment has been ongoing for well over 40+ years, it seemed fitting that some kind of struggle should be depicted in the illustration. Initial sketches simply flanked the terms “militia” and “individual” which are the two terms that truly provide the ambiguity in the amendment which arguably has become the focus of all such public discussion. The added entanglement of the revolutionary and modern firearms with the very banners that are displaying the two terms really says it all… without taking any sides. 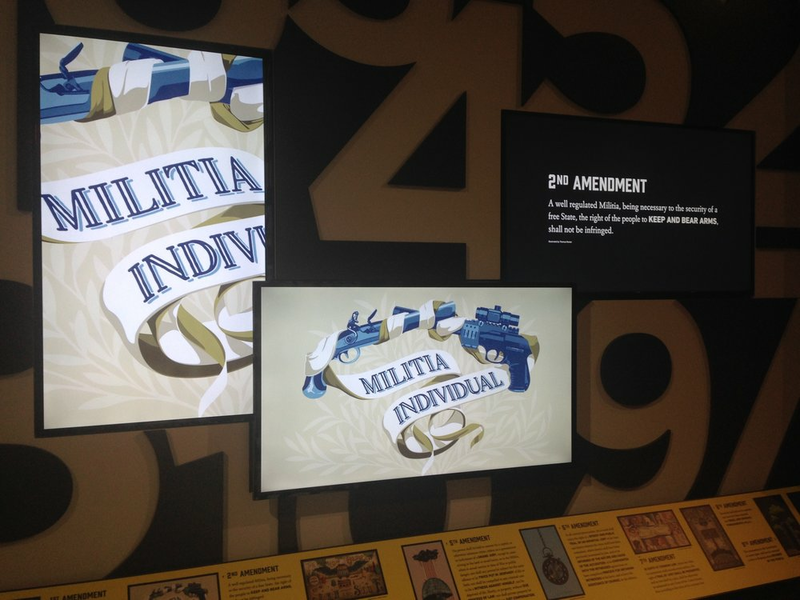 2nd Amendment as it appeared in “Constituting Liberty” at National Constitution Center..
“Second Amendment” was one of 10 illustrations for each amendment that comprises The Bill of Rights. Pencil sketch, values in grey, color study and a nearly final version with alternative type.